The murder of 21 year-old Matthew Shepard in Laramie, Wyoming in 1998 quickly became a watershed event that triggered changes in perceptions and attitudes in the American public. While many before took a "live and let live" posture toward gays and lesbians, the widespread media attention to the Shepard case raised awareness of the ugliness of hate crimes. A repeated response was "nobody deserves to be treated like that." Moises Kaufman, an openly gay writer and theater director (Gross Indecency: The Three Trials of Oscar Wilde), traveled to Laramie with his crew where they conducted interviews with some 100 townspeople. 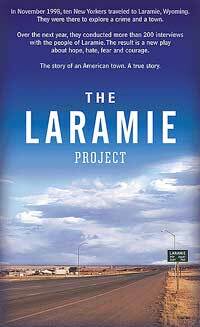 Based on those interviews, Kaufman wrote The Laramie Project for the stage and the stage production has now been adapted for film. The film reenacts Kaufman and his crew in their visit to Laramie, with actors playing the roles of crew and townspeople, interspersed with some archival footage. It’s a hybrid sort of film–an acted-out documentary. The case itself is so poignant that it would take a heart of ice not to tear up watching it unfold once again and listening to the deeply felt emotions of Shepard’s friends and family and others in the town. The combination of loss with the brutality and maliciousness with which it was perpetrated generates both sorrow and legitimate anger in the audience as well as those onscreen. Kaufman records the protestations of some of the townspeople who reiterate the theme that Laramie is a "live and let live" place. While they doubtlessly believe that, their naivete (or denial) is discovered in remarks from some of the gay residents. The woman who was the first faculty member at the University to come out as a lesbian (in 1992) was told by other lesbians that just to be seen with her would be a big problem. And a gay farmer says what "live and let live" really means is, "If I don’t tell you I’m a fag, you won’t beat the crap out of me." An interesting contrast is made between a wise and humane Catholic priest and a fundamentalist Protestant minister who says that he hopes that Shepard "had a chance to reflect on his lifestyle" as he lay exposed and dying, tied to a fence after being tortured and brutally pistol whipped. And Shepard’s father, in a statement to the court that was about to sentence one of the perpetrators, is eloquent in his love and anger and in the compassion he finds even for the thug who murdered his son. No doubt because of the notoriety of the case and the political outrage it generated, Kaufman was able to attract a small host of big name actors to participate in the film, most in cameo roles. The one performance that is genuinely notable is that of Amy Madigan playing a local deputy, the first authority to reach Matthew after he was found, the one who cut the ropes that tied him to the fence and, in doing so, unwittingly exposed herself to HIV, since Shepard tested positive. In all, this is a workmanlike film and important in that it will reach a large audience with a story that needs to be told. But The Laramie Project somehow falls short of the profound impact for which these events cry out. On the one hand, it doesn’t have the immediacy or authenticity of a pure (as against a scripted and reenacted) documentary; the absence of the real people in the case (and from the interviews) is unavoidably felt. And, on the other hand, it doesn’t have the art that a distilled, fictionalized version might have had. What no doubt worked brilliantly on the stage, where audiences are accustomed to accepting conventions of artificiality, does not in this case translate as well to the screen, particularly in view of the film’s standard, rather ordinary cinematography and editing which make little use of the added potential of film as the medium for this story.